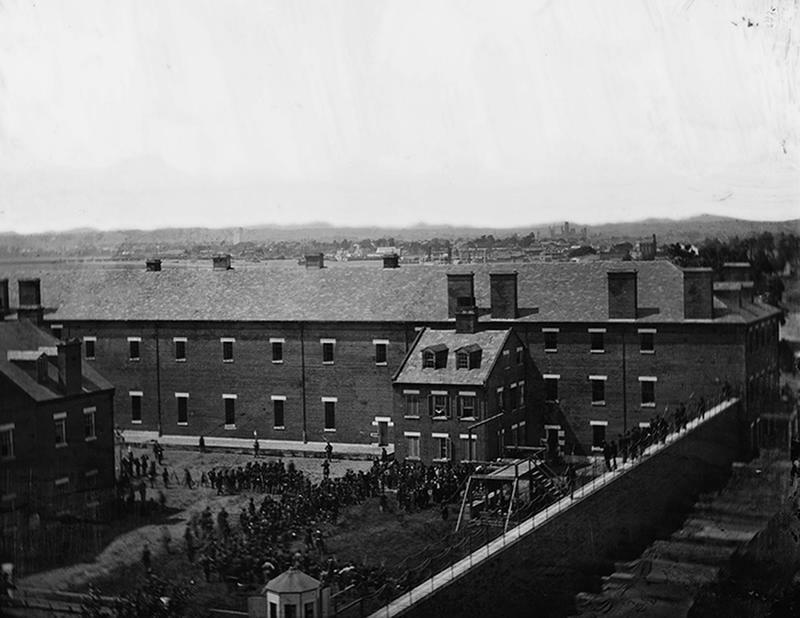 After the assassination of Abraham Lincoln, the government arrested hundreds of people. Most were released because the evidence against them was insufficient. However, eight people were charged and on May 1, 1865, President Andrew Johnson had a military commission try the accused persons. 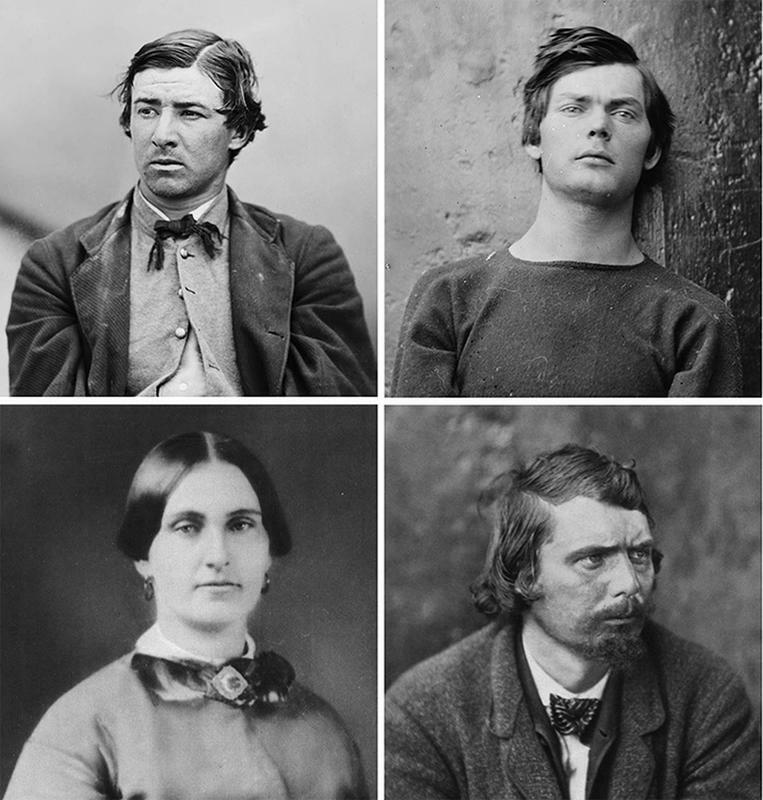 This series of macabre images by Scottish photographer Alexander Gardner were taken moments before the execution of the four known Lincoln conspirators: David Herold, Lewis Powell, Mary Suratt and George Atzerodt. The actual trial started on May 10th and lasted for about 7 weeks. The defendants were allowed to have their lawyers and witnesses, but were forbidden to testify on their own behalf. 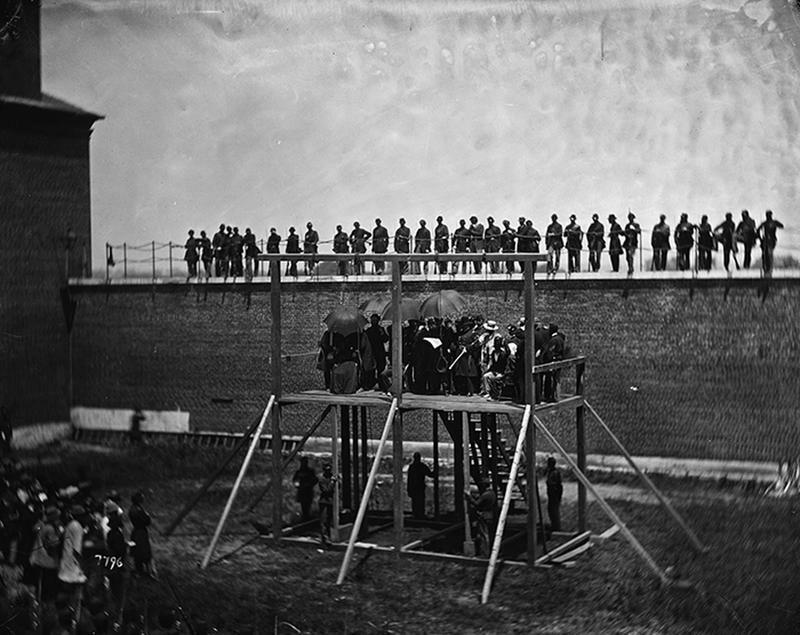 On June 29, 1865, the Military Commission met in secret to deliberate and review the trial. For a death sentence to happen, 6 votes from the 9-member commission was required. Samuel Arnold, Dr. Samuel Mudd and Michael O’Laughlen received a sentence of “hard labor for life,” while Edman Spangler was sentenced to a 6-year prison time. 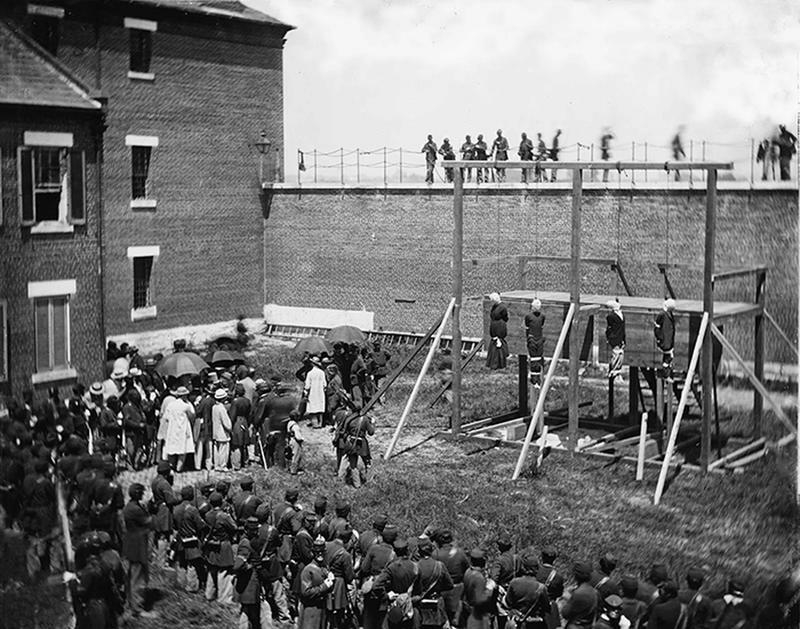 The very next day, General Hartrandft informed the four prisoners that they would hang the next day. David Herold (below)- A 21-year-old impressionable and simple-minded pharmacy clerk. He accompanied the injured Booth to the home of Dr. Samuel Mudd, who set Booths' injured leg. The two men then escaped through Maryland and Virginia until they were caught by the authorities in a barn. 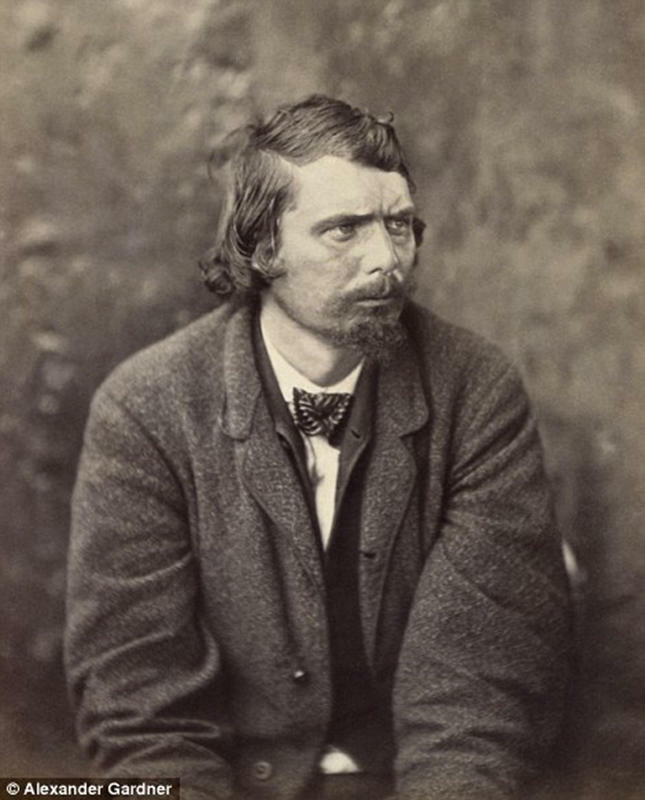 Herold surrendered but Booth was shot and died a few hours later. 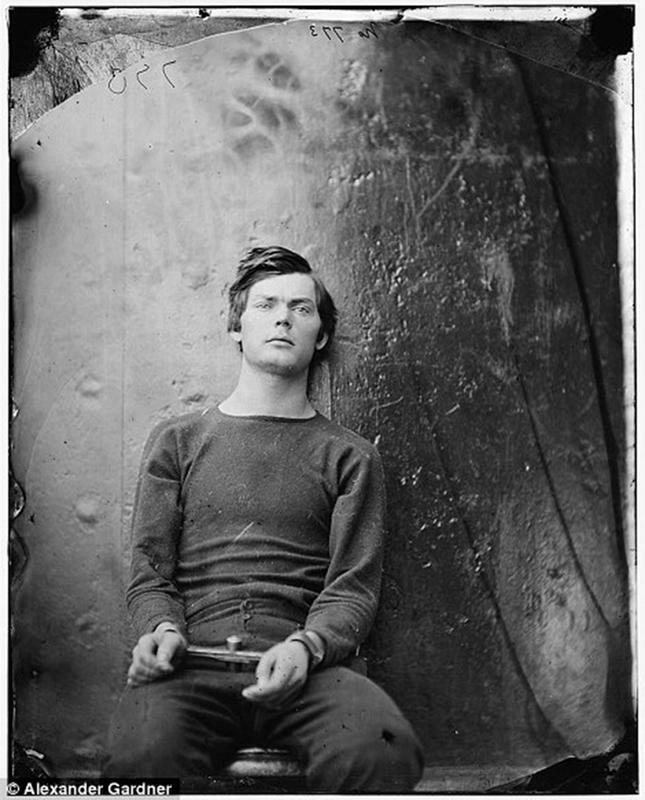 Lewis Powell (below)- Powell was a former Confederate prisoner of war. He was recruited to be the muscle of the kidnapping plot. 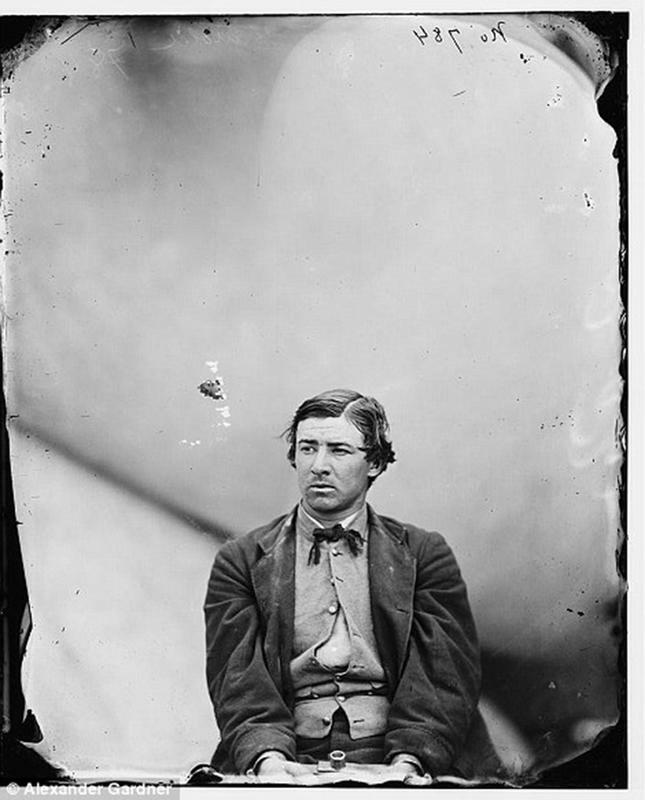 When the kidnapping plan failed, Booth told Powell to kill Secretary of State William Seward. He went into Seward’s home and severely injured Sec. Seward, Seward’s son and a bodyguard. 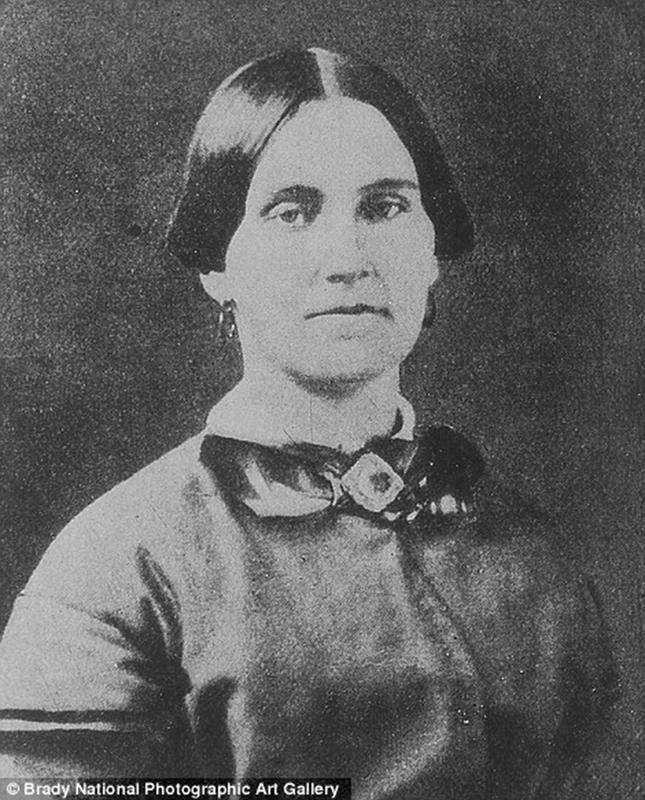 Mary Suratt (below) - owned the boarding house in Washington, DC where the conspirators met. 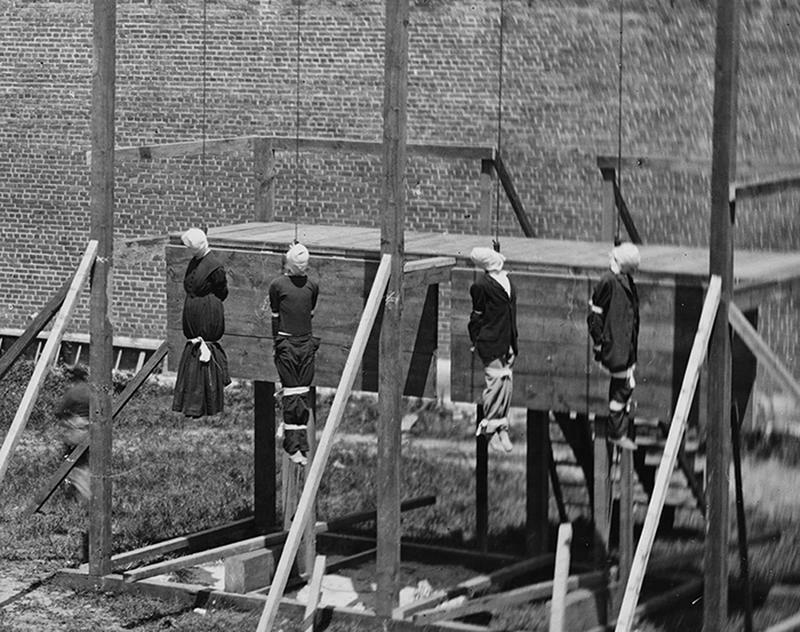 She was the very first woman executed by the US federal government. George Azterodt (below) - was a carriage painter and a boatman who helped ferry Confederate spies across Maryland waterways during the war. He was recruited by Booth to kill Vice President Andrew Johnson, but lost his nerve and stayed in a bar, drinking, instead. 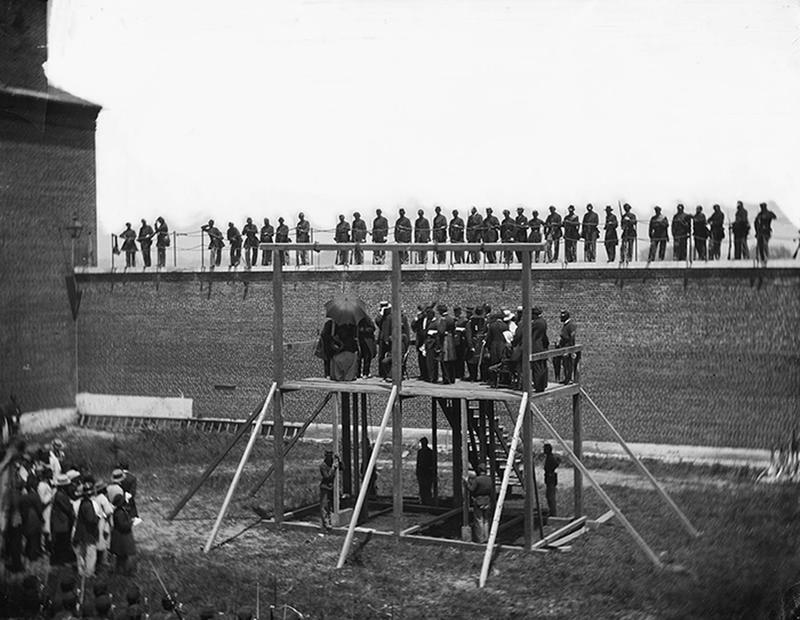 On the afternoon of July 7, 1865, the four conspirators climbed the hastily built gallows. 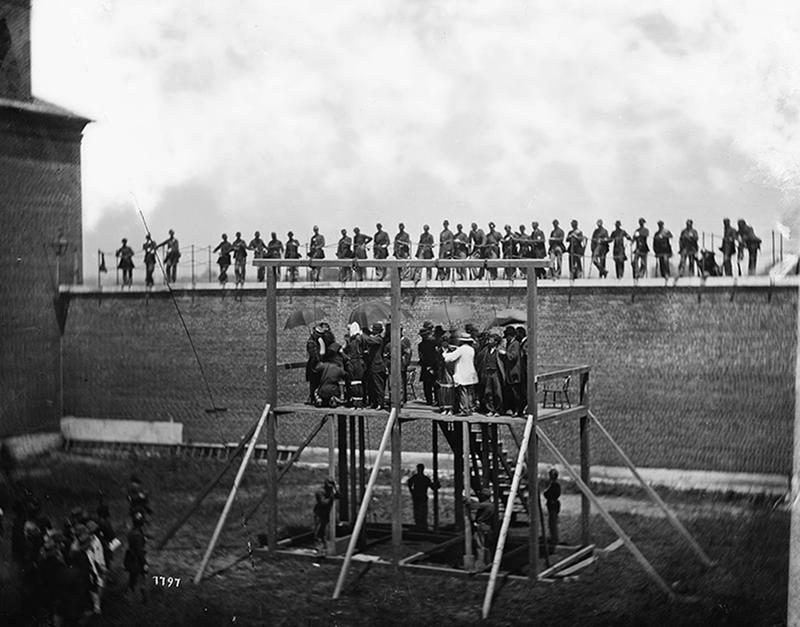 More than 1,000 people, which included government officials, members of the US armed formed, friends and family of the condemned, witnesses, and reporters, came with their tickets as spectators of the execution. Nooses were placed around their necks and hoods were placed over their heads. After the last rites, the trap door was opened and all four fell. It was reported that Atzerodt yelled at this very last moment: “May we meet in another world.” They were all dead within minutes. The bodies were left to hang and swing for 25 more minutes before they were finally cut down. Over the years, people have questioned and attacked the verdicts and procedures of the 1865 Military Commission. They claimed that the sentences were unduly harsh and criticized the fact that a death penalty was imposed with only a two-thirds vote of Commission members. Critics have also complained about the lack of proof and the lack of opportunity for the defense counsel to prepare adequately for the trial.